JOSIE PEARCE CROWNED AS 12TH MISS BERLIN-GORHAM AND MIA LETOURNEAU CROWNED AS MISS BERLIN-GORHAM’S OUTSTANDING TEEN! The Twelfth Annual Miss Berlin-Gorham Scholarship Competition took place in the Medallion Opera House at the Gorham Town Hall on Saturday, November 4th. Miss Josie Pearce of Hanover was crowned Miss Berlin-Gorham 2018 and was awarded a $5,000 scholarship. The daughter of Owen and Erin Pearce of Rossmoor, California. Josie attends Dartmouth College. Josie performed classical piano: “Doctor Gradus ad Parnassum” her platform is “Lupus Foundation of America”. The local title earned her the right to compete in the Miss New Hampshire Scholarship Program to be held on April 26, 27 & 28th, 2018 at the Stockbridge Theater at Pinkerton Academy in Derry, NH. The first runner up, Ashley Marsh of Laconia who attends Plymouth State University, and is the daughter of Dawn Marsh, won a $500 scholarship, and the second runner up, MacKenzie Herlihy of Tamworth who attends Southern Maine Community College and is the daughter of Thomas and Alexandra Herlihy, won a $250 scholarship. Contestants who are residents of or attend school full time in Coos, Grafton or Carroll County are eligible to compete for the title of Miss Berlin-Gorham. Mia Letourneau of Berlin was crowned Miss Berlin-Gorham’s Outstanding Teen 2018 and won a $250 scholarship. Mia is the daughter of Steven and Lauren Letourneau. She will compete for a larger scholarship at the Miss New Hampshire’s Outstanding Teen competition on February 9, 10 & 11th, 2018 at Pinkerton Academy’s Stockbridge Theatre. For more information on the Miss Berlin-Gorham Scholarship Program, find us on Facebook at Miss Berlin-Gorham and Miss Berlin-Gorham’s Outstanding Teen and for more information on the Miss New Hampshire Scholarship Program and Miss NH’s Outstanding Teen Program, go to missnh.org. Ed Hollum, Independent Insurance Agent/Broker is conducting 4 community meetings to help people with their rights and options during the Medicare Annual Enrollment Period which runs from Oct 15th through Dec 7th. AEP is when people check Prescription Drug and or Medicare Advantage Health and Prescription Drug Plans (Medicare Part C Advantage Plans) and decide whether to stay in current plan or enroll in a new plan effective 1/1/18. This year is a year people should really review their plans as there are lots of significant changes. Ed will hold informal meaning with no need to schedule appointments or stay for a formal presentation. The purpose is to provide some understanding of what is available in a setting where you can ask a local Licensed Agent questions. If you would like to schedule a later time to have Ed provide an in-home presentation you can arrange at that time. Enrollment is not typically handled at these meetings due to privacy concerns but can be arranged, if necessary. Lots of people find the process confusing and do nothing during AEP which causes your plan to roll over to next year. You then have very limited ability to make changes till next AEP. This may be ok, but all people have changes in their needs and plans themselves change every year. You can see how not checking for many years could have you in a plan that one time was a good fit but could very different compared to newer plans. Aqua MASH – Ever wanted to try out one of our adult classes but not sure if it is the right one for you? Join us Saturday October 21st from 11-1pm for our Aqua MASH. We will “mash” together all of our adult classes in 10 minute segments. Try any or all for FREE! There is no cost to get in, no cost to participate, and no pressure to join. Come enjoy a fall treat and see what we have to offer! Adult Classes – Come have fun with us! Learn to Swim Classes – The Early Winter Session registrations are now open. This session will go from October 30th – December 15th. Only a few more chances to get to the North Conway Farmer’s Market Saturday 9 am – noon at the Community Center. The last one is October 8. In conjunction with the Jackson Area Chamber of Commerce’s annual Return of the Pumpkin People Contest Settlers Green presents the Pumpkin People Decorating Contest. Return of the Pumpkin People is a self-guided tour to view the amazing pumpkin creations by participating businesses and individuals around the Valley. Maps and “People’s Choice” ballots will be available at all participating properties. While you are checking out the pumpkin people in Jackson stop in at the Cassidy Gallery for a Jewelry making demonstration by jewelry artist Wendy Wetherbee. Can you make it out of the Ghoullog unharmed after a 50-minute haunt leads you through dark twists and turns and an outdoor element leading through the scariest of dark woods. Enjoy spectacular views of the highest peaks in the Northeast on a FREE scenic lift ride. The Wildcat Tavern presents “Cold River Radio Mini Series”, Vanessa Trouble and The Red Hot Swing, Saturday, October 1, 7:30 opening act, 8:30 main act. MARSHFIELD STATION, NH – Join Appalachian Mountain Club Senior Interpretive Naturalist, Nancy Ritger, on the Cog Railway, for a tour of Mount Washington’s amazing natural environment on Monday, August 31. Mount Washington, the highest peak in the Northeast, is home to some of the rarest alpine plant-life in the world, existing only in the Presidential Range. This naturalist tour consists of a round trip ride on the Cog Railway and a three-hour guided tour of the summit. Nancy will lead the group in exploring the tundra environment at the top of the mountain, taking the opportunity to walk down the Crawford Path and observing the adaptations of the plants and animals to live in such a harsh environment. Tour participants will get the chance to observe a variety of alpine species that can be found around the summit cone, from the low-growing krumholtz to the tightly bound cushion plant. Participants should plan to arrive at the railway base station 45 minutes prior to the 12:30 pm departure time for an introductory session. The round trip tour is approximately 5 hours, returning around 5:30. The cost is $109 per person, ages 12 and over. Participants should be comfortable traversing rocky terrain and dress for mountain-top weather (temperatures at the summit can be 30 degrees colder than at the base), including boots or sturdy shoes, layers, windbreaker, rain gear, gloves, hat, water and snacks. Space is very limited. Additional information is available at thecog.com. Participants must book in advance by calling 603.278.5404 The Mount Washington Cog Railway is located on Base Station Road, Marshfield Station, NH, 6 miles from Rt. 302 and historic Bretton Woods, NH. The Mount Washington Cog Railway, established in 1869, is the World’s first mountain-climbing cog railway. The Cog is open from April through November, operating both steam and biodiesel locomotives from 2 to 10 trips per day. There is a museum, gifts, food and restrooms at the base and summit. Happy New Year! We’re ushering in 2014 with plenty of snow for a season of exciting skiing, snowmobiling, sleighrides and horseback rides, ice skating, ice climbing, dog sledding, winter hiking and winter adventure. Phew! There’s so much to do this winter that we’re dedicating this whole newsletter to Snow Much Fun! Speaking of snow, have you signed up to receive our weekly About The Snow newsletter? Launched last year, this weekly newsletter is packed with up-to-date information about ski and snow conditions, upcoming events, ski & stay packages, where to find the deals on and off the slopes, weather forecasts and informational articles. Each week we randomly choose a name of one lucky reader to win lift tickets or XC ski passes too. Simply click here and indicate an interest in skiing. Drive safely on your way up to a snow and ski getaway this month. Attitash Military Salute Weekend at Attitash & Wildcat: The nation’s defenders and their families will be honored throughout the weekend with FREE lift tickets for active, veteran and retired service men and women as well as discounted lift tickets ($45 all ages) for active duty family members with ID on January 25 and 26 at both Attitash and Wildcat. The Attitash Grand Summit Hotel will offer a 20-percent discount on lodging to military personnel for the weekend. Call 888-554-1900 for reservations. 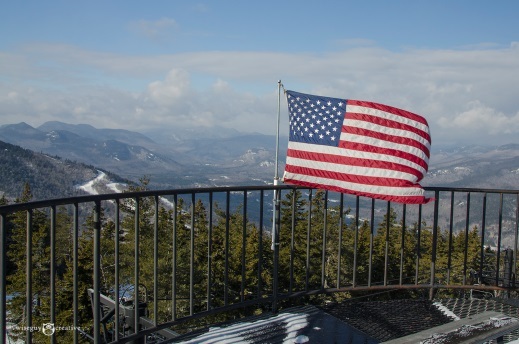 On Saturday, January 25, 2014, all are welcome to take part in the special flag parade, led by an honor guard, which begins at the top of Attitash and concludes with the National Anthem at the base area at approximately 1pm. Après ski entertainment will take place in Ptarmigan’s Pub from 3-6pm. On Sunday, January 26, get ready for fun competition on the slopes in the 4th Annual Battle of the Branches GS Race. Racers (including kids!) will select which branch they are representing and their points will go toward each branch to determine a winner. Info: Click here. The Mt Washington Valley Chamber of Commerce, working in conjunction with the Valley’s 13 ski resorts and XC Centers and lodging community, has created a Midweek Ski Package with one ticket available throughout the Valley’s ski areas/XC centers. Come skiing Monday through Thursday, and the savings are great. The ticket is only available in conjunction with a lodging package. Click here to find a complete listing of participating properties. Here’s one Midweek skiing package that’s packed with value. 2 all day all lift passes (one per person) for downhill skiing at the Valley’s 7 ski resorts OR 2 all day trail passes + rental + group lesson for Nordic skiing at the Valley’s 6 XC Centers. Learn about all things natural from the Mountain Garden Club. On January 13, 2014, the Mountain Garden Club will presentPlants impacting New England’s History Lecture: Local author June O’Donal discovered fascinating facts about how our ancestors used native plants for shelter, warmth, food, health, clothing and their livelihoods. What’s the connection between King Pines and the American Revolution? Hemlock Trees and tanneries, and much more. Learn how plants became significant players in the New England landscape from the Mountain Garden Club. Program begins at 11am; Mountain Garden Club hospitality/social hour begins at 9:30am in Salyard’s Center for the Arts, Conway Village. Info: www.mountaingardenclub.org. Tis the season to get out and play in the snow in Mt Washington Valley. How? 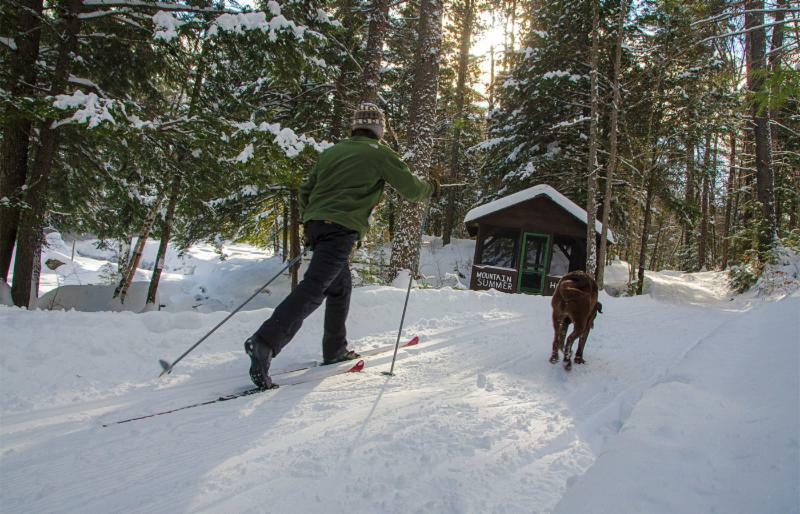 Here are five great ways to enjoy outdoor adventure throughout January on the trails and off! Whether on skis, snowcoach or via ice ax, enjoy one of these unique adventures this winter. From the top of the world! Take a trip to the top of Mt. Washington with the Mount Washington Observatory. The Observatory’s Winter Day trips offer the chance to get to the top of New England’s highest peak in the winter. Enjoy a ride up the mountain in the Observatory’s snowcat, take a guided tour of the Observatory and meet Marty, the official summit cat, then enjoy lunch with the scientists and volunteers who live and work atop the peak before heading down the mountain in the afternoon. For those who want something longer, the Observatory offers Overnight Trips as well. From the Seat of a SnowCoach: Travel up the Mt. Washington Auto Road via the one-of-a-kind SnowCoach. A specially constructed all-wheel drive and unique 4-track system allows the SnowCoach to deliver you to the world above treeline at the 4.5 mile mark on the Auto Road for an unforgettable winter experience. For the more adventurous, the SnowCoach offers the option to XC ski, telemark or snowshoe back down the Auto Road. SnowCoach tours last approximately 1.5 hours and depart daily, weather permitting, December through March from Great Glen Trails on a first come, first served basis. – all of which offer guided mountaineering and ice climbing trips to Mt. Washington and the surrounding Presidentials. From the back of a Dogsled: Muddy Paw Sled Dog Kennel, based in Jefferson offers a variety of year-round dogsled rides. Many of the dogs at Muddy Paws are rescued or second chance dogs, and they are ready to take you on dogsled rides ranging from two to fifty miles, including overnight trips. Best of all, the tours are hands-on and interactive, so you get to drive the sled too! Join Muddy Paws for a trip based out of their education center in Jefferson, or choose a trip departing from one of their off-site locations, including the Omni Mount Washington Resort at Bretton Woods. Rates for dogsledding tours vary depending on location, distance and group size, so call 603-545-4533 for more information, or check out their website for more information. From the seat of a snowmobile: Whether it’s gliding through peaceful pine woods, on the state of New Hampshire’s hundreds of miles of trails (which go right through Mt Washington Valley) or across open meadows, Mt Washington Valley is one place that’s ideal for snowmobile adventures. Mt Washington Valley is lucky to have many snowmobile outfitters offering rentals, guided tours and sales of sleds and accessories. 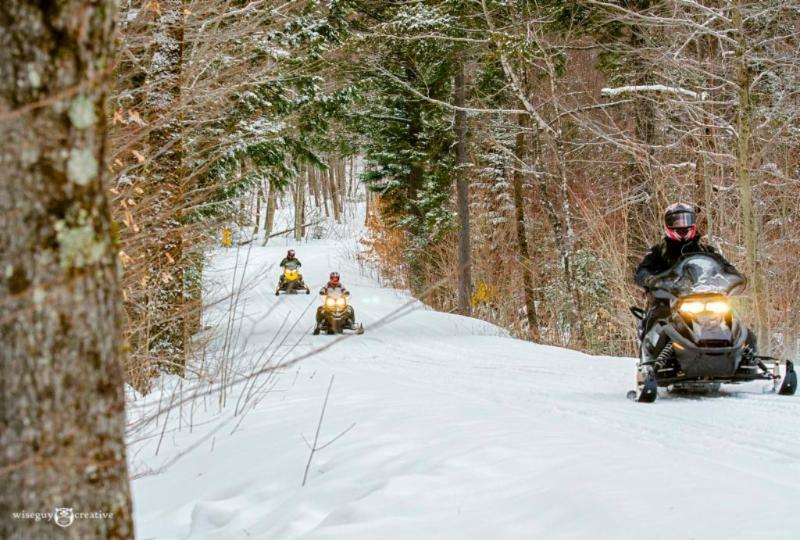 And now with all the snow on the trails, Christmas Week will be the ideal time to plan a snowmobiling getaway into New Hampshire’s North Country. The family that plays together smiles together on and off the slopes in Mt Washington Valley. Saturdays through January: Cranapalooza at Cranmore: Every Saturday (December 28 through March 8, and select days during holiday periods) you’ll find family entertainment in the new C-More’s Theater at the Artist Falls Lodge, Enjoy s’mores at the outdoor fire pit, a C-More-led parade across the base area, face painting, and more – all while adults soak up live music in Zip’s Pub and Grille. Then gather the family back together for evening fireworks (held on select dates at the base of the South Slope). On January 18th, Scott Baer will be playing in the pub, and naturalists will be at Cranapalooza with an awesome interactive nature program. 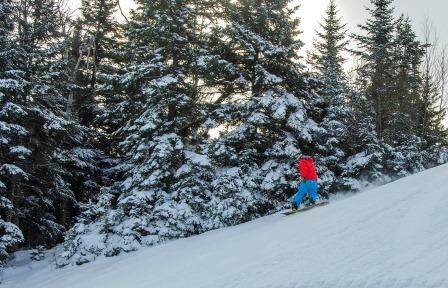 January 3: New England Ski Day at Shawnee Peak: New England residents mark your calendars! Purchase your ticket to ski or ride all day and night at Shawnee Peak on Friday January 3rd for just $19 with the presentation of your New England driver’s license. And the deal just keeps getting better – rentals will just be $19 all day too. Kids get the deal with a license holder too. Info: Click here. 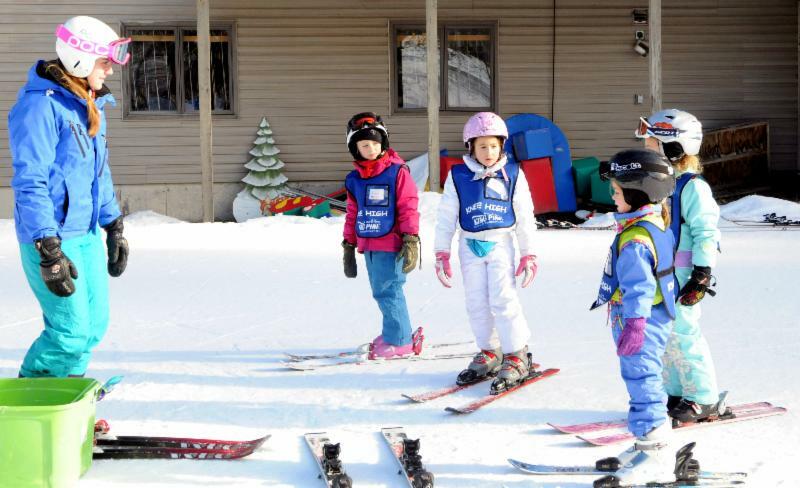 January 12: TD Bank Kids Skifest: An extra fun day for kids at Great Glen! Come join in the morning, afternoon or all day for winter fun on skis! Steve’s Awesome Obstacle Course, Team Sprint Relays, group games, treats to eat at the Cabin, a lollipop race and more is in store. Mini-lessons will be offered in both morning and afternoon for first-time cross country youth skiers. Special trail pass rate for participants; free rentals for kids, 9am-4pm. Trail Pass required for adults and children at a reduced rate of $5. Activities and children’s rental equipment FREE. Rentals for participating parent/guardians: $10. 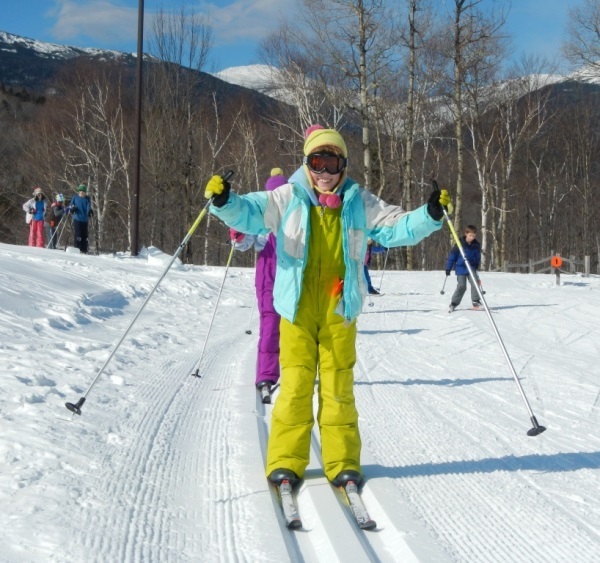 Info: 603.466.2333, http://www.greatglentrails.com/winter/family-programs/td-bank-kids-ski-day/. January 18 & 25: Night Skiing and Family Racing at King Pine: Family Racing on Saturday nights feature a dual recreation race. Races are free to all with a lift ticket, but are weather dependent. The race course is open from 6:00 – 8:00pm on the King Pine Trail. Info: Click here. What could be more romantic than a moonlit walk through the woods? Add a guided snowshoe tour, and hot chocolate at the end, and here’s the perfect couples caper! On January 18th couples can choose between two moonlit snowshoe tours in Mt Washington Valley. Moonlit Snowshoe Tours at Great Glen Trails: Experience the wonder of a winter walk on the moonlit snow. Join an AMC Naturalist Guide on a guided full moon snowshoe walk. We will use our senses (and no flashlights) to navigate the trails. You will listen for owls calling and explore the winter landscape by light of the full moon.7:00-8:30pm, $12 per person over 12, or $35 per family of four or more, free under 12 (minimum age: 8). Snowshoe rentals available, $10. Info: 603.466.2333 , www.greatglentrails.com/winter/family-programs/moonlit-snowshoe-tours/. Snowshoe Tours at Bretton Woods Nordic Center: Snow and a full moon accentuate the breathtaking beauty of Omni Mount Washington Resort’s Nordic and snowshoe terrain. Join the Nordic Center staff on this hour-long excursion along the moonlit cross-country trails of the Resort. If the views and experience are not hot enough, hot chocolate and a roaring fire will warm you following the adventure. Info: Click here. January 4: Steam in the Snow on Conway Scenic RR: Perfect for photo and train buffs alike, it’s Mass Bay Railroad Enthusiast’s 7th annual steam-powered photographers’ special excursion on the Conway Scenic Railroad. This unique event features multiple photo stops and photo run-bys starring Conway Scenic’s 0-6-0 steam engine 7470 (built by the Grand Trunk Railroad in 1921). The train departs the North Conway Station at 10:30am and travels non-stop to the Notchland Inn in Crawford Notch for its first photo stop. It then returns to North Conway with numerous stops and photo run-bys on the return trip. Have the camera ready. 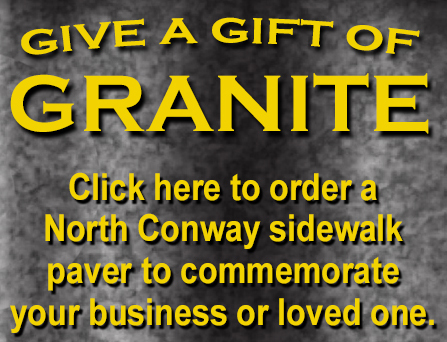 Info: 800-232-5251, www.conwayscenic.com/?post_type=event. January 10: Ticket Roll Back Day at Cranmore: Make this your day to ski Cranmore! Tickets are rolled back to $9 on this day only. Info: http://www.cranmore.com/winter/events_winter. January 12: U Go Girl Race #2 at Attitash: Half of the proceeds from the U Go Girl Race Series benefit Jen’s Friends Cancer Foundation, an organization based in the Mt. Washington Valley that provides financial assistance and other resources to cancer patients and their families who are uninsured, underinsured, or financially challenged. Race Registration: 8-9:45am in the South Wing, entry fee is $10. Info: www.attitash.com/events-and-activities.html?id=5316 . January 11: Winter Feels Good Day at Great Glen Trails: As part of the nationwide awareness campaign, Winter Feels Good, which promotes the health, fitness and social benefits of snow sports participation, Great Glen Trails will offer free cross country skiing and snowshoeing to first timers only on Saturday, from 12:30 – 4:00pm. Please call ahead to reserve your 45 minute lesson time. Info: 603-466-2333, www.snowlink.com/wintertrails/about/aboutwintertrails.aspx. January 11: Free Fisher/Tubbs/Swix Free Demo Day at Jackson Ski Touring Foundation – Try out the latest and greatest equipment from back country to racing. Fischer will have a range of skis and boots, Swix will have demo poles and waxing advice, and Tubbs will have snowshoe options. Demo day starts at 10am and runs through 2pm. There is no charge for trying the demo equipment, however trail passes required for trail access. For more information or to register email raetha@jackson.org or call 383-9355 or visit www.jacksonxc.org. January 18: 10th Annual Whitaker Woods Snowshoe Scramble: The 4-mile race course will consist of groomed trails and twisty single track through Mt Washington Valley Ski and Snowshoe Foundation trails in Whitaker Woods. Start time is 10 am. The advance registration fee is $15; $20 for registration January 14 through race day. This event is a Mt Washington Valley Ski and Snowshoe Foundation fundraiser. Info: 603-356-9920, www.mwvskitouring.org/SnowshoeScramble/index.html. Jan 2, 3 and 4: Enjoy Affordable Art: From 10am to 3pm the Mt. Washington Valley Arts Assoc. will hold a 3-day Annual Affordable Arts Sale at the DownStairs Gallery, 16 Norcross Place. Come shop with their juried artists, and find that perfect gift or your personal treasure. You will even find a few of signature one-of-a-kind hand painted skis left for a $75 donation to the MWVArts. 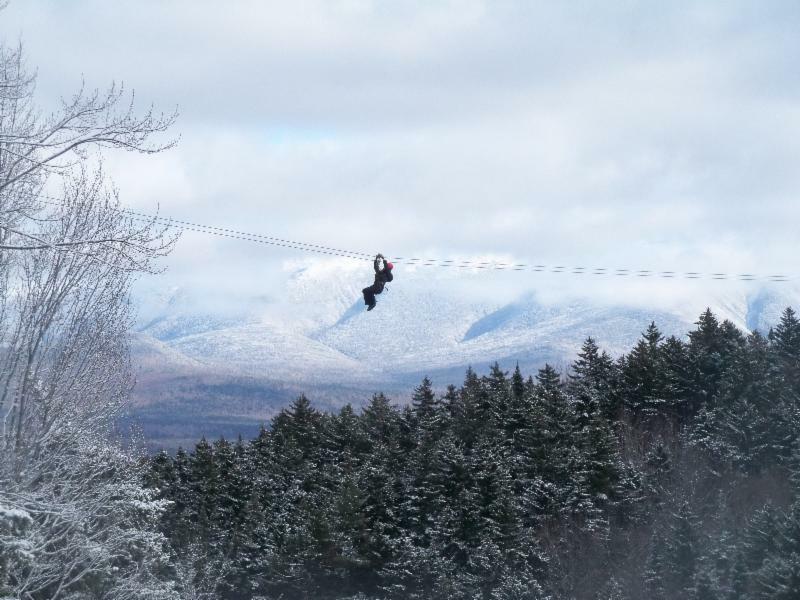 Every Tuesday in January: 241 Canopy Tours at Bretton Woods: Two guests can take flight on the Bretton Woods Canopy Tour on non-holiday Tuesdays for just $110! Call 603-278-4ZIP  for reservations. (May not be combined with other offers or promotions). at Jackson Ski Touring. Two ski for the price of one on non-holiday Wednesdays. Three great deals from Black Mountain:Back my popular demand are Black Mountain’s Tuesday ‘Girls Day Out’; Ladies ski all day for only $20 and can also add lunch for $10. Wednesday is Happy Hump Day- Ski at Black Mountain for $17 from 12:30 – 4:00 p.m. Thursday celebrates the Breakfast Club Day; skiers 55 and over can enjoy a great breakfast and ski all day for only $25! Info: www.blackmt.com. January 11-17: Learn to Ski and Ride Free in NH: Ski NH’s learn to ski & snowboard free week is January 11-17, 2014 when first-time skiers & snowboarders receive a free learn to ski or snowboard lesson, free equipment rentals & a free beginner terrain lift ticket. Participants must register with Ski NH to download a Learn to Ski & Ride Free coupon, and then make a reservation with one of the participating resorts or XC Centers (Bretton Woods, King Pine, Cranmore Mountain, Jackson Ski Touring Center, Great Glen Trails, Bretton Woods XC Center, Purity Spring XC & Snowshoe Reserve). Registration begins on January 2 at 10am and is first-come, first-served. Registration: Online sign-up at skinh.com, then at participating ski areas and XC Centers for lessons, Saturday-Friday. Info: Click here. $5 off ski tuning and 10% off ski and snowboard rentals with this coupon. Get a free season pass to Bretton Woods with every junior equipment season rental. 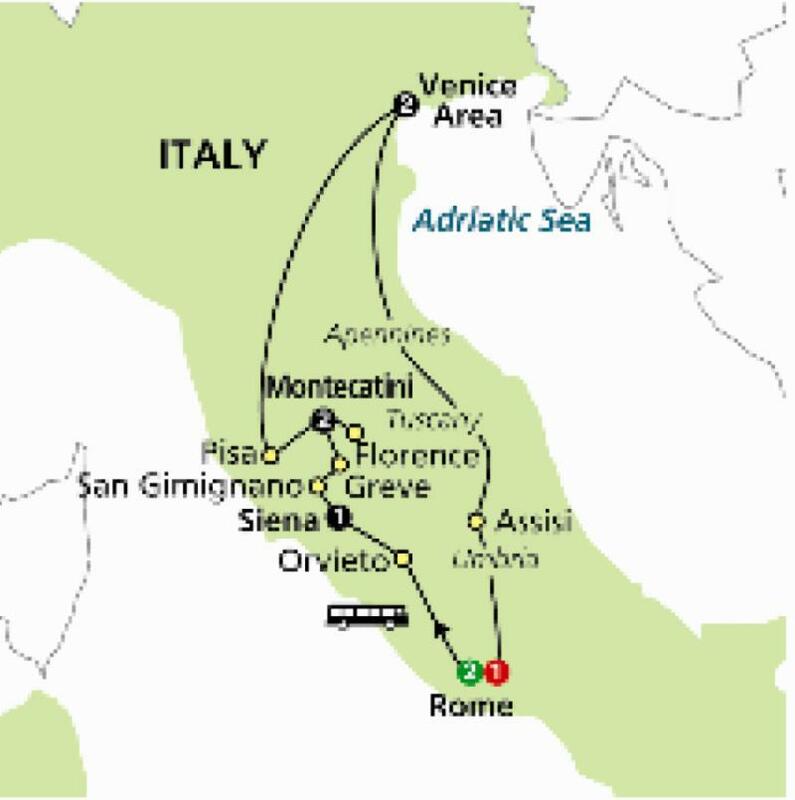 Day 8: Journey South and visit the world famous basilica in Assisi. Our Chamber in partnership with our member, Globus Travel, has negotiated a great deal on an adventure of a lifetime! Join a friend and a Chamber representative for a trip to Italy. Italy, a country filled with history, amazing art, delicious cuisine, remarkable architecture, and splendid beauty — you’ll see and feel it all on this magnificent tour through Italy. for single and triple rates & for more information! Bikes, Boats and Nordic Gear at Great Glen Trails! Come enjoy the beautiful fall foliage and get a first look at 2014’s hottest new cross country ski equipment. Get it now, so you’re ready for when the snow falls! Previous years ski equipment 25%- 60% off! Plus outdoor clothing, hats, gloves, hydration packs, Smartwool socks and much more all at 25-60% off! Most bikes are just three months old, well cared for and in good condition! Cannondale / Schwinn Comfort Bikes starting at $250, Kids Kona Mountain Bikes starting at $250, Adult Kona Mountain Bikes starting at $375. Spray skirts, paddles, PFD’s, river booties and helmets. Come on up and enjoy the fresh air and scenery!